There are about 250 species of bees in the UK and many more in the rest of Europe. Many are quite small and people do not realise that they are bees. The vast majority have ineffectual stings and are harmless to people. Many will thrive in gardens if given suitable nesting sites and suitable flowers from which to feed. There are many plants for bees. Large-scale changes in agricultural practices in the 20th century led to an overall decrease in the abundance of many species, especially in the open countryside away from gardens. However a number of wild bee species are currently increasing their geographical range in the UK, and two northern european species, (the Tree Bumblebee and the Ivy Mining Bee) have colonised the UK in the last 15 years. There are in fact thousands of species of bees in the world. There are almost 250 wild bee species in the UK including about 25 species of bumblebees and over 230 types of solitary bees. In fact we have a relatively small bee fauna, probably due to our wet and windy climate caused by our proximity to the Atlantic ocean. Further to the south and east in warmer and drier areas of Europe the bee fauna is much richer. 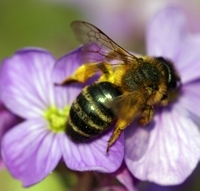 In the UK the honey bee now normally lives in a domesticated situation in managed beehives, rather than as a wild creature, although feral colonies can be found. I don't cover the honey bee in any detail on this site because beekeeping is a big subject and a lot of information about it is already available. Many species of wild bees are uncommon because they require specialised habitats such as sandy banks or cliffs in which to build their nests, but there are are plenty of species commonly seen in gardens. These tend to be generalist species, and gardens are an important resource for them both in terms of food and nesting habitat. As well as honeybees and bumblebees, a few species of solitary bees in the UK live socially in colonies where individuals-co-operate. Others make their nests near each other in 'aggregations' even though the individual females in the aggregations do not co-operate together. Like their close relatives the wasps, bees are sedentary. The females return many times to their nest site to provision the young with food. 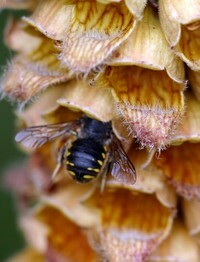 Very small types of solitary bees cannot fly long distances to forage, so they need suitable flowers close to their nest site. Male bees do not take part in collecting food or rearing the young, and their sole purpose is to mate with females. Although the role of other groups of insects in pollination is thought be significant, it is certain that bees, especially wild species, play the predominant role. They are important both economically, by pollinating many fruit and vegetables crops, and ecologically, by ensuring cross-pollination in wild flowers thereby maintaining the diversity of flora in wild habitats. There are several common and distinctive solitary bees that visit gardens: see my Fact Sheet about wild bees in the garden. Most lists of 'plants for bees' provided for beekeepers concentrate on those flowers suitable for honey bees. You cannot assume that 'bee plants' recommended for honey bees will be appropriate for other bees. If the garden is to be truly pollinator-friendly then a greater range of flowers is required to accommodate the needs of the whole spectrum of wild bees, which vary in size from the large long-tongued Bombus hortorum to numerous tiny solitary bees with very small mouthparts. In particular, flowers in the Apiaceae family (Umbellifers) and small yellow flowers in the Asteraceae are used as forage by numerous solitary bees. 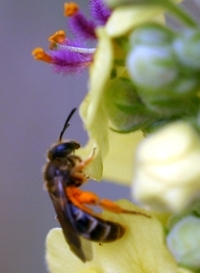 The image to the left shows a small solitary bee (Lasioglossum) on a flower of Mullein (Verbascum nigrum). This bee is common in gardens where the right kind of flowers are growing; such bees will only visit flowers whose pollen and nectar are accessible to their small mouthparts. Bumblebees and Gardens with a plant list for bumblebees that you can download. 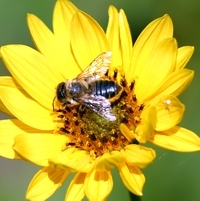 Insects and Flowers explains how bees (and other insects) collect food from flowers. Flower shapes explains how flowers appeal to different groups of insects. How to make a Bee Hotel includes information about Mason Bees and Leafcutter bees and explains how to build a bee house. 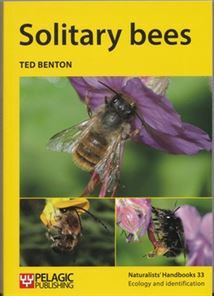 Fact Sheets for a printer-friendly fact sheet about common solitary bees you may see in your garden. Bumblebees active in winter discusses the phenomenon of winter-active Bombus terrestris.